The relative ease of gaining insight into your chatty brother-in-law’s portfolio means that everyone can be a sentiment analyst. To appreciate the long-term sentiment, traders and investors need to step back and observe long-term indicators of investor behavior. Informal sentiment readings at their best can activate your “spidey senses” but more often than not, knee jerk reactions to short-term sentiment sideline traders and investors during the best times. It is becoming clearer every day that there is less and less utility in moment-to-moment trading. It is always healthy to take your nose off the glass and get some perspective. 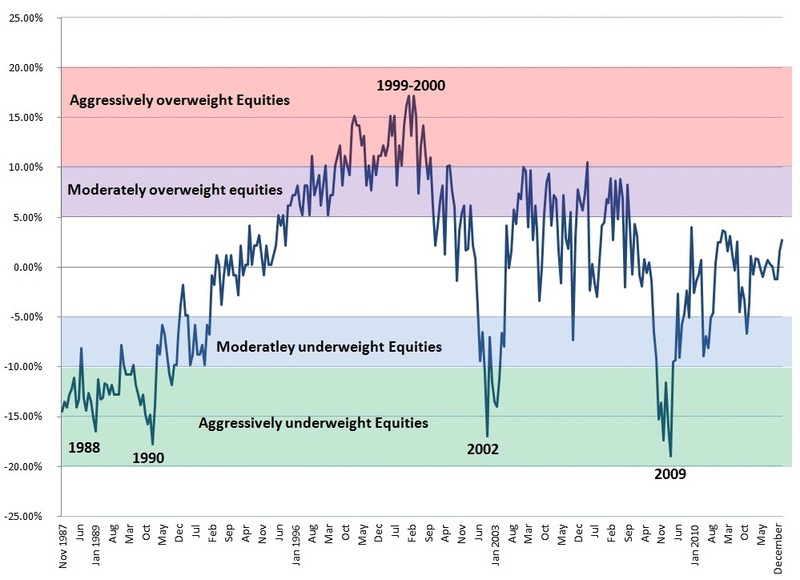 Barry Ritholtz posted the chart below on his blog calling attention to a 15% deviation in equity allocation as a long-term extreme in sentiment. As you can see, we’re nowhere near those levels. My original suggestion was that one standard deviation above the long-term average would signal that the rally had too many believers to be sustainable in the long-term. I later wrote that I was focusing on a reading of 90 as the first area of concern. Take a step back and realize that we are at an all-time high in the market and consumer sentiment and equity allocation are both hovering around a long-term average. If there is any lesson in market behavior it is that the extremes inform the average, so do not expect sentiment to stay “average” for long. If we return to even moderately high equity allocations, the market has a lot more room to run. Obviously this will not happen in a straight line — expect similar volatility to what we’ve seen in the last couple years. 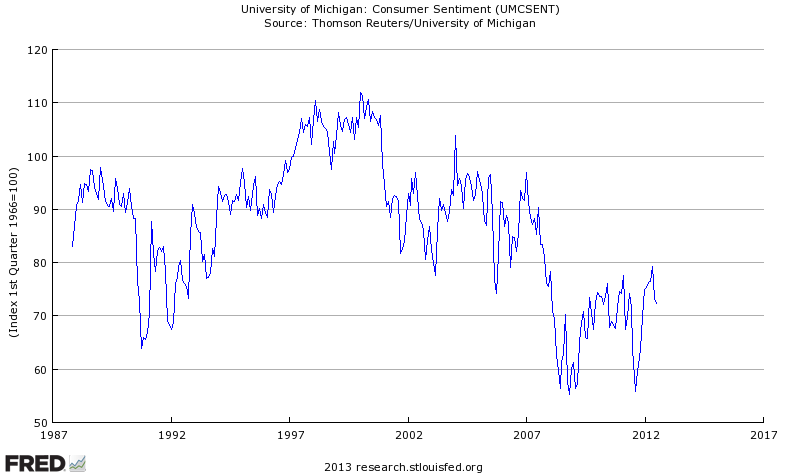 A couple lessons: Consumer sentiment and equity allocation inform the same thing. Don’t get caught up in which study is the perfect definitive measure. 2. Sentiment analysis is not a precise tool used to top-tick the market. In fact, some of the most attractive equity market returns will occur after everyone is very bullish but before the house of cards comes tumbling down. Long-term, these statistics should keep you on the right side of the move. I’m officially adding AAII Equity Asset Allocation to my list of long-term studies.